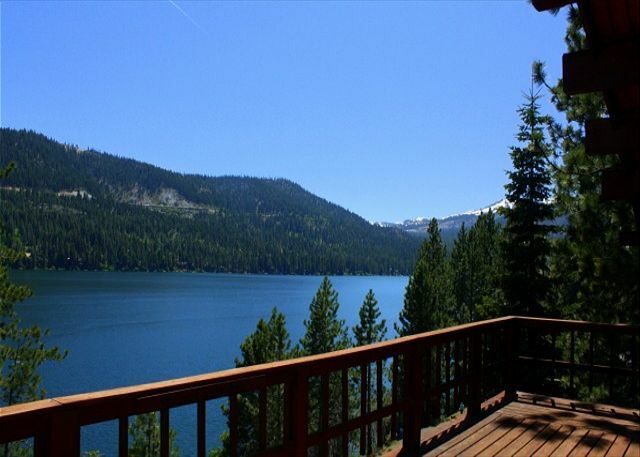 Truckee, CA United States - Rincon 051 | Donner Lake Realty, Inc. Vacation rental house. 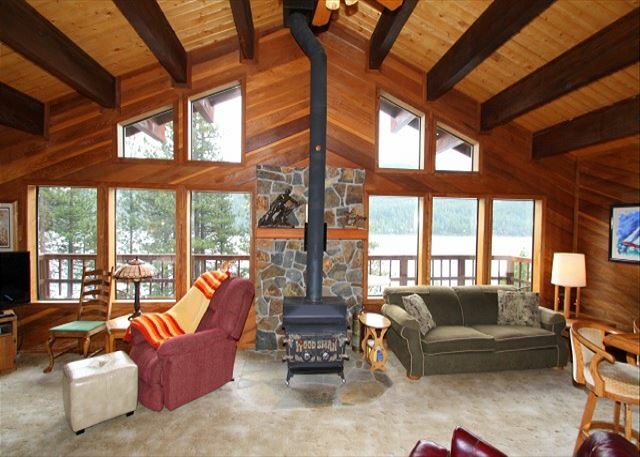 Sleeps 10, 4 bedrooms, 2 bathrooms. No pets allowed. Parking Pad located on Donner Ave. 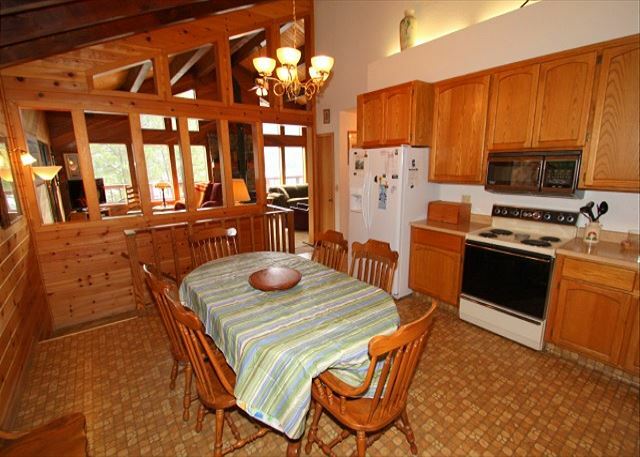 The Rincon unit is 4 bedroom, 2 bath cabin will sleep up to 10. NO PETS ALLOWED, allergy free home. 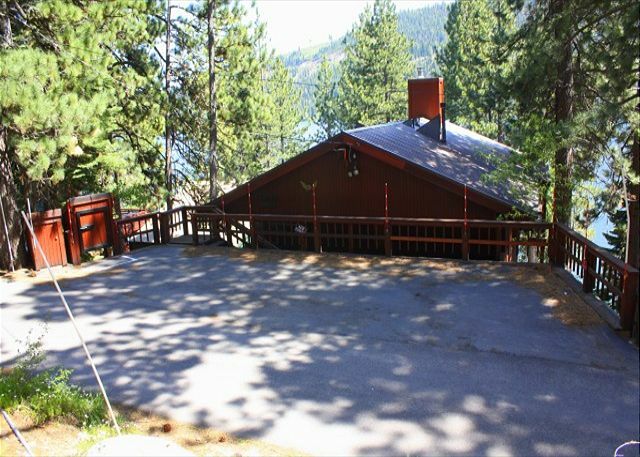 This well maintained, classic cabin features stunning lake and mountain views as well as direct lake access via a private staircase.down to the Public docks located across the street. 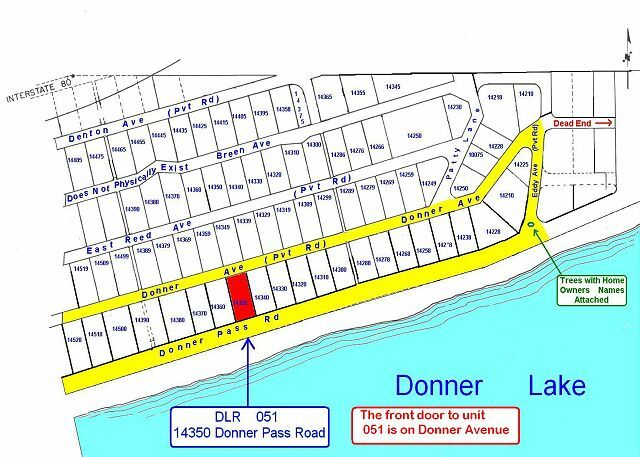 The parking pad is accessed on Donner Avenue and can accommodate 3 compact cars. 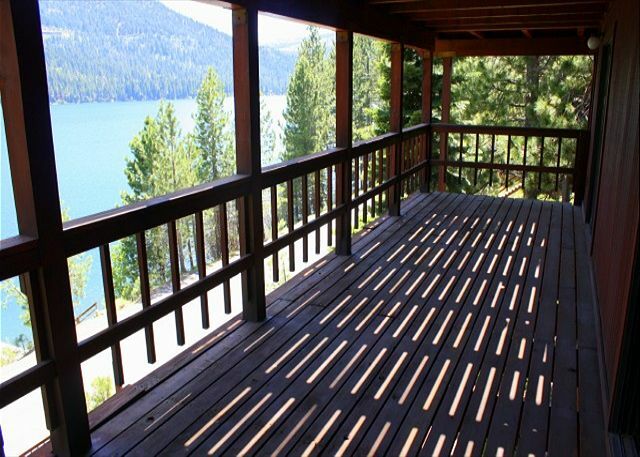 From the parking pad you descend 11 stairs to the semi-enclosed front deck. 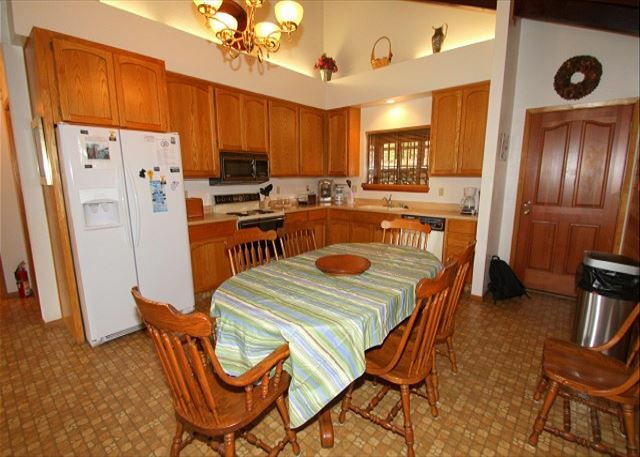 You enter the unit directly into the spacious eat-in Kitchen. 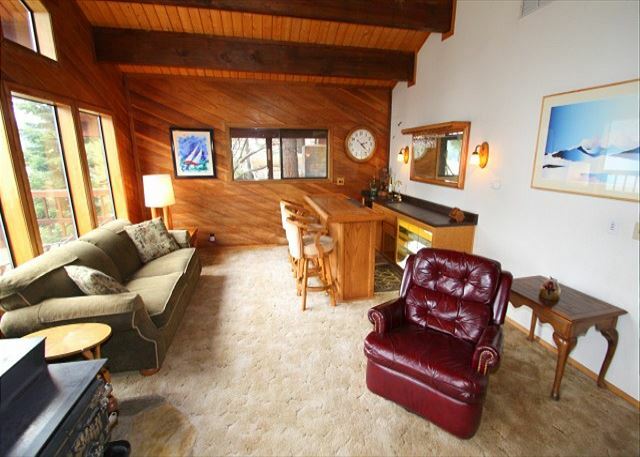 Continue into the living area featuring a wood burning stove, full bar, vaulted wood ceilings with exposed beams, picture windows, and access to the wrap around deck with lake views. 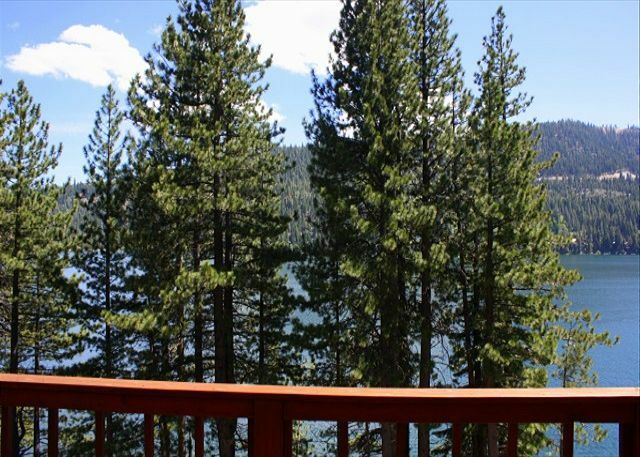 The deck on the main level takes full advantage of the panoramic lake and mountain views and features a Gas BBQ and patio furniture. 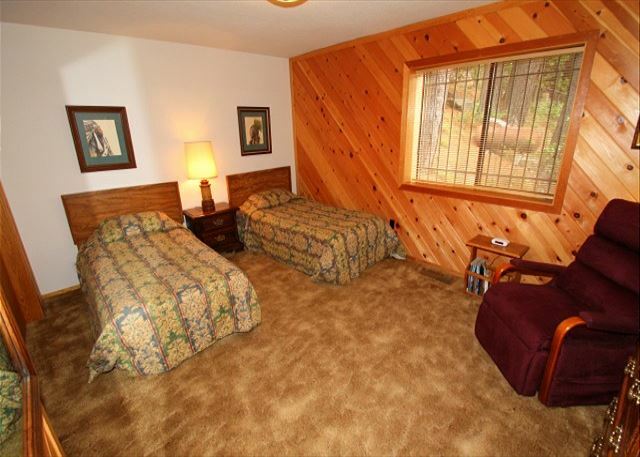 Also located on the main level off the Kitchen is the Master Bedroom with a king sized bed, TV, vaulted ceilings and large closet. 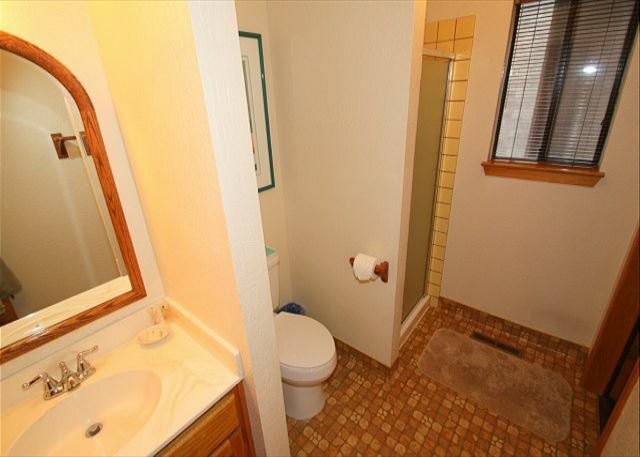 The adjoining bathroom has a single sink with large vanity, toilet and tub/shower combo w/ sliding glass doors. Downstairs are an additional 3 bedrooms (2 with roll-away beds in the closets), bathroom, washer/dryer, private deck and hidden den. 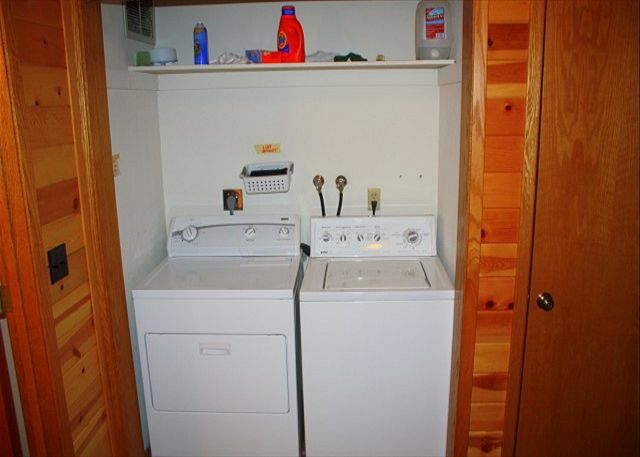 The bathroom is located at the bottom of the stairs and has a single sink vanity, toilet, and shower stall. 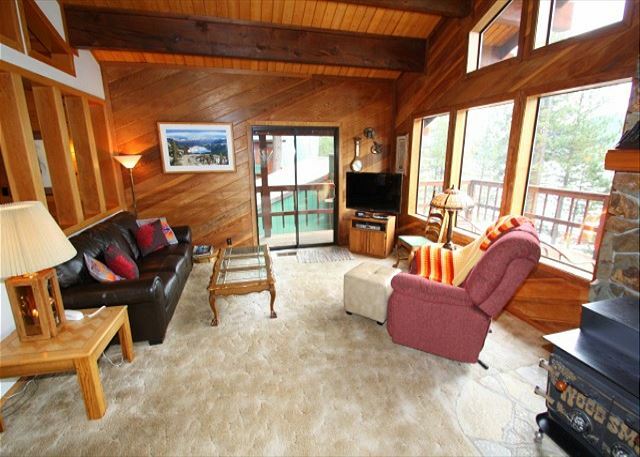 The two bedrooms on the lake side each feature sliding glass doors to a private deck with lake and mountain views. One room has a queen sized bed while the other has two twin beds. 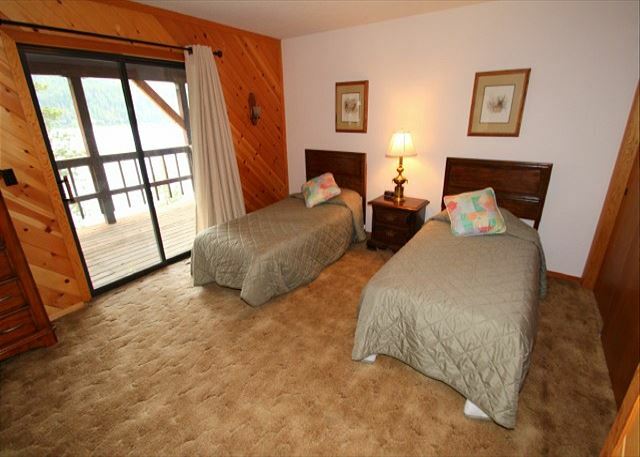 The final downstairs bedroom does not feature lake views and has two twin beds. The door at the end of the hall leads out to a staircase that leads down to a third deck and the Public Docks located just across the street. These docks are available on a first come, first served basis. 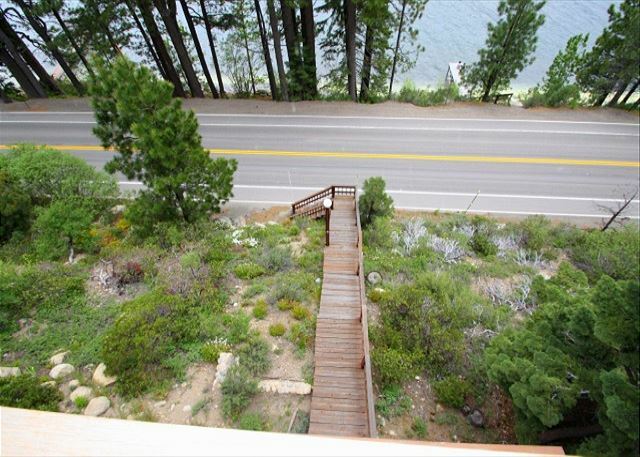 There are 18 stairs down to the deck and a total of 64 stairs down to Donner Pass Road. 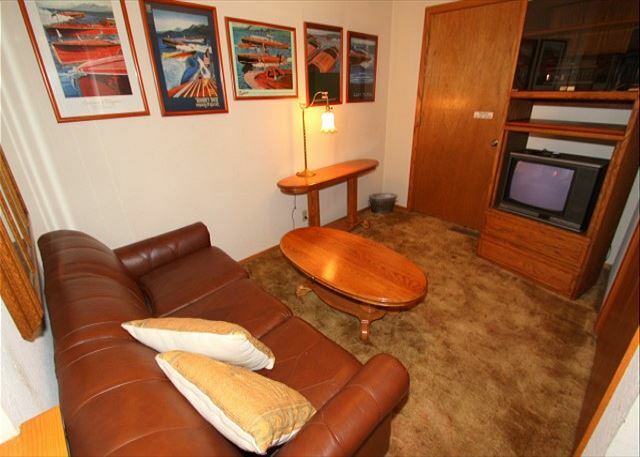 This unit rents with a floating 3 night minimum during the summer months only. 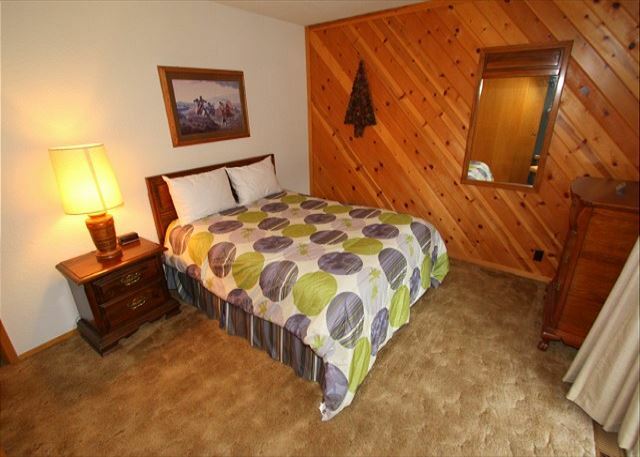 Our units do not have sheets, pillow cases, or towels included in the rental. However, we do offer linen rental service with 72 hrs notice before arrival: sheets, pillow cases, and towels at a onetime fee of $10 per person. Check in time is 3pm and check out time is 10am. 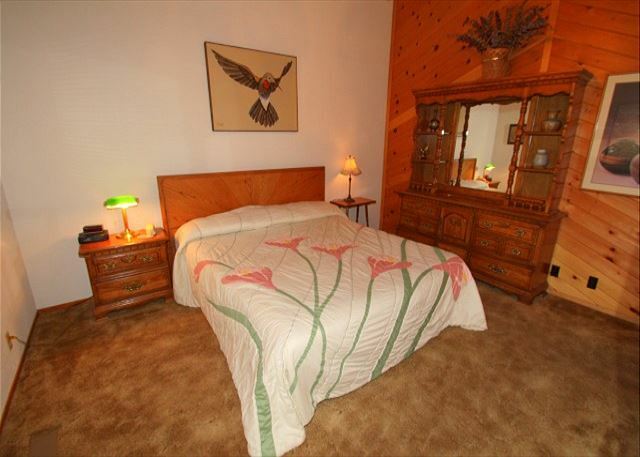 **Nightly Minimum Subject to Change for Holidays** 4 night minimum for Thanksgiving, 7 night minimum for Christmas/New Year's, 3 night minimum for Martin Luther Holiday Weekend, 3 night minimum for Presidents Holiday Weekend, 3 night minimum over the 4th of July, 3 night minimum for Labor Day holiday Weekend. 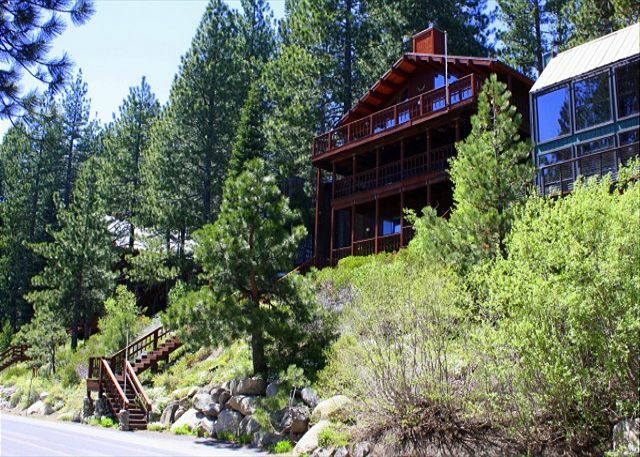 Discounted rate for stay of 7 nights or more!